I am going through a reminiscing phase at the moment. It has a lot to do with Rafaela turning one, growing up and going into day care. I was looking at photos of Rafaela on Australia day sleeping in her pram, all 9 days old and she is the tiniest little bubba choo. One year on she can enjoy the day much more. A splash in the pool and some BBQ, She might just have her first taste of Lamb! We get to have a little dress up in Green & Gold on Friday at day care too. I cannot wait to dress her up in costumes. My husband and I are pretty good at them if I do say so myself! But I think we will just stick to colour blocking on Friday, ease into it. A great little dish, light lunch or side is this Green & Gold pesto pasta, inspired by Australia day. It’s really just pesto pasta with peas and corn, very tasty and I serve it with wholemeal spiral pasta. It makes it a great finger food for Raff to get all messy with. Yep I have had to let go of my cleaning anxiety and just let her go for it. I actually feel really good when I see her eating all her food even if her hair is now green and I’m washing pesto out of her ears. Homemade pesto is great to have on hand in the freezer; I enjoy pesto pasta more than pasta and sauce most of the time. It’s a great way to use up leftover herbs before they go off. Freeze them in portion sizes; it will make it easier to whip up quick meals. This is also great summer pasta for adults too, hot or cold. Add Rocket, red onion, bacon or prawns, dried chilli, salt and voilà! 2 cups cooked wholegrain pasta or brown rice. 1. Pulse the garlic, basil and olive oil in a blender or food processor until minced. 2. Add the lemon juice and pepper and pulse again. 3. Remove to a bowl and stir in the parmesan cheese. 4. Mix as much of the pesto as you like with the peas and pasta and freeze the rest. 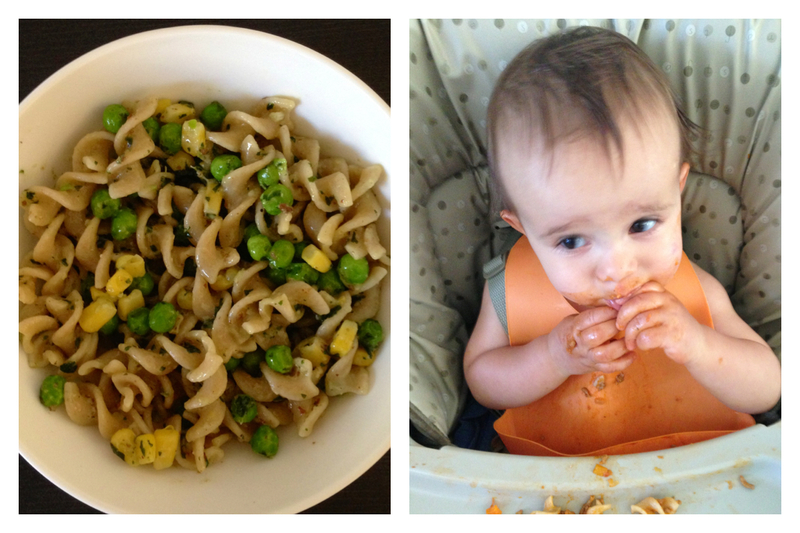 Pesto Pasta and Rafaela enjoying spiral pasta, getting messy!